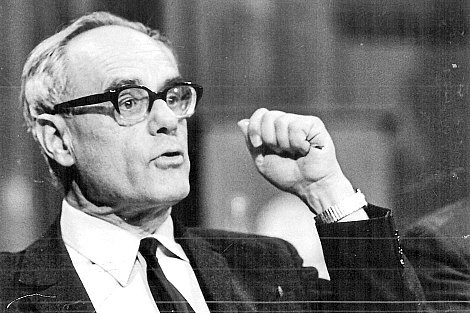 Some 60 years ago the German Catholic theologian Karl Rahner (pictured) wrote a pamphlet on free speech in the Catholic Church. His explorations may seem now to be very tentative, but were daring at a time when the Pope took positions on disputed questions and demanded acquiescence. But the deeper differences arise out of Pope Francis' distinctive perspective on the communicating faith. He is less concerned with the content of what is taught than with how it is understood, particularly by those who are at the margins of the Catholic Church. He is concerned that preoccupation with explaining the whole Christian message in technically correct language often leaves people at the margins of church alienated from what they see as bad news. So he asks how the Gospel can be heard as good news by those on the edge of Church and society. He answers that Bishops and priests responsible for teaching faith should go out compassionately to people at the edge of church, not to judge them but to enter their world. Then they will find words and gestures to communicate the Gospel as Good News. To teach faith to the marginalised you need to live and learn faith at the margins. Pope Francis' take, based on Jesus' example, is radical. It naturally stirs debate. He and all the Bishops, though not all Catholics, are agreed in accepting received church teaching on faith and moral practice. They differ, however, whether particular disciplinary practices, such as the exclusion of the divorced and remarried from receiving communion, are demanded by Catholic faith. Many bishops differ with the Pope about what should have priority in Catholic life: commending faith to people at the margins of church, or strengthening the faith of those who at the centre. Because Bishops hesitate to disagree with Popes in public and because the move to the margins by Pope Francis has been so popular, these differences are not always articulated. But they are clearly present. Andrew Hamilton is consulting editor of Eureka Street.. Interesting article Andrew. As a student of politics, your distinction between 'free speech in society' and 'in church life' interests me. In reading John Honner's book from 2007 on Frederic Ozanam, I saw a similar distinction in Ozanam's thought between secular and spiritual authority. I'd like to read something that would 'flesh out' this distinction and its origins a bit more. Also, just as de Tocqueville noted the democratising spirit in (the) America(s) so we can see Pope Francis bringing a less strictured view on freedom of speech in the church, which is novel. I wonder what Bill Morris, former Bishop of Toowoomba, thinks of free speech in the church. It is interesting to see how Fr Andrew describes refusal of communion to divorced and re-married Catholics as a 'disciplinary practice'. "They differ, however, whether particular disciplinary practices, such as the exclusion of the divorced and remarried from receiving communion, are demanded by Catholic faith." By such references in articles written by Catholic clergy and theologians do we indirectly learn that clearly defined doctrine of the past [The divorced and remarried are in a state of mortal sin and so cannot receive Communion] has been changed without general announcement to a very different level of moral standing - in this case, a matter of Church discipline. The apparent inability of the Church to openly declare changes in doctrine, with announcement from the bishops locally propagated from the pulpit, causes far more confusion and scepticism than would acceptance of free speech in the Church. It is time the Church recognised that free speech and transparency work together to build and retain trust. Communicating faith to those on the margins of not only church but society in general. Concentrating less on content of the Christian message than on the way it is understood. Making this year a year of special compassion. Entering the world of the marginalized. Andrew ,thanks to your articlle ,these thoughts are my reflections for today. In the city yesterday I was confronted by homeless people sleeping rough, a young woman totally out of control screaming at a partner and hitting him, a couple obviously under the influence of drugs being a danger to themselves and others, and so much more. i questioned how could compassion be best shared with these people ? How can a message of hope and peace be given.? How can we convey to law makers, politicians ,mental health policy makers , ministers ,teachers the need for attention to the actual plight of many in our world. Then I reminded myself yes we do have free speech . We can write letters , speak out in all forums, enlighten people's conception of the real world. Find ways of action. We do not have to put up with what we see . We can be "mad as hell" about the state of affairs and we can ceaselessly tell it how it is. Freedom of speech in the church is a great way to start. Let's get away from black and white views based on ideas of a past age.eg.women as role models up on pedestals ,staying out of dangerous neighborhoods.! Let's open our eyes to the bigger picture . Let's speak about how it is today and how we can truly communicate with those around us. We should be grateful to thinkers, theologians such as Karl Rahner, the Flemish Dominican Edward Schillebeeckx, Hans Kung and advocates off liberation theology such as Leonardo Boff. My understanding of the writings of these thinkers is that the Christian faith is learnt not only by the dissemination of the opinions of those who keep within the confines of current orthodoxy but by those who move out from their safe shelter to stimulate thought and inquiry about the truths of faith. After I interviewed Hans Kung for half an hour on national television he gave me a copy of his book Infallible? - An Enquiry in which he wrote: non in destructionem sed in aedificationem ecclesiae - not for the destruction but the building up, reinforcement of the Church. We can learn much from, are richer with the thoughts and undoubted faith of these people and the leadership of Pope Francis. Thank you Andrew. Charles Darwin shrank from publishing his genius for approx 20 years, aware of "confusion" and conflict his insights and scientific evidence would elicit. Glad he did oublish. I believe the established RC Church deserves confusion. No words attributed to Jesus in say the synoptic gospels spring to mind of his being apprehensive of confusion ? Bring it on I say- moderately! Thank you yet again Andrew! I very much appreciate internet sites such as this- which are outside the strictures of our Church- as a forum for many of us to express an opinion freely. For me this has been such a gift. In order that we can live together in security and harmony society sets limits on the degree to which we can exercise our freedom to do as we like. If we go beyond these limits and harm others in society we must be prepared to accept consequences. In a society such as the Catholic church we have an other dimension. As baptised Christians we glory in the liberty of the children of God. We have the theological virtue of Faith - a mystery in itself - and we have the content of the Faith - the existence of God, the Trinity, and all that God has revealed to us through the life of Christ and the scriptures and through the Church. Now there's the rub! John XXIII's axiom "In essentials unity, in peripherals tolerance, in all things charity" goes some way towards guiding us in how we should discuss the content of our Faith. But discuss it we can. Pope Francis seems to have great faith that the grace of the Holy Spirit will be poured out more abundantly where men and women of good will can discuss contentious church issues honestly, openly and lovingly, free from fear and persecution. "Can speech be free in the Catholic Church?" Yes! The problem is that too few members of the hierarchy bloody-well listen! Thank God for Francis - perhaps he will sort out the naval gazing intransigents!!! After just having read James Alison's Undergoing God I am not confused. he shows how there is not one place in the bible where loving lesbian relationships are mentioned let alone condemned. I was brought up during the Pre Vatican 11 world of obeying dogmatic rules with out question. It was not until I was doing a Grad Dip (RE) and later a Masters in Theology that I really came to understand what Vatican 11 was teaching us. My understanding of the teaching authority of the Church has undergone quite a change as a result. However the patterns of the past have proved hard to change , particularly under Pope John Paul 11. Bishop Bill Morris soon found that out to his cost and that of the Australian Church. I totally agree with Ian Fraser comments about the proclamation of changes in the non core beliefs and practices following the Council. Many Catholics remain very confused about what it means to be a Catholic today- no wonder so many are in the fringe or lapsed My own adult children are in this category.I hope Pope Francis can bring in the needed reform but I am very concerned that he faces much opposition form the ultra conservative Curia. I hope the Australian Church can become much more inclusive with a lot less insistence on rules and tradition. Let the Holy Spirit rule. Thanks Andrew for your article. I think speech must be free in the Catholic Church, which claims to proclaim truth. I agree with Pope Francis, and also believe Peter Wearne made an interesting point. Christ himself proclaimed "Know the truth and the truth will make you free". This is paramount and must not be twisted to mean some sort of truth, or a type of truth; surely it means total truth as far as it can possibly be known, and this would to a point would have to be an evolving process. True contemplative faith by its very nature cannot incorporate mental barricades. The exclusion of adulterers and all in the state of mortal sin from Holy Communion is not merely a disciplinary practise. It is itself received church teaching, coming down from the New Testament. CCC 1385: 'To respond to this invitation we must prepare ourselves for so great and so holy a moment. St. Paul urges us to examine our conscience: "Whoever, therefore, eats the bread or drinks the cup of the Lord in an unworthy manner will be guilty of profaning the body and blood of the Lord. Let a man examine himself, and so eat of the bread and drink of the cup. For any one who eats and drinks without discerning the body eats and drinks judgement upon himself." Anyone conscious of a grave sin must receive the sacrament of Reconciliation before coming to communion.' As Cardinal Sarah says, the teaching of the magisterium and pastoral practice are locked together: “The idea that would consist in placing the Magisterium in a nice box by detaching it from pastoral practice — which could evolve according to the circumstances, fads, and passions — is a form of heresy, a dangerous schizophrenic pathology." Despite the Kasperites' incoherent attempts to argue otherwise, the issue is no more up for revision than whether there are three or four persons in the Blessed Trinity. Change takes place in the Catholic Church in quite a different fashion to the way that the Anglican Church initiates change. The Anglicans hold synods which involve all levels of the faithful and the issues are aired publicly and often with heated argument and threats of secession. Eventually the matter is voted on and the Anglican Church proceeds to implement the change. In the Catholic Church the faithful make the changes by following their conscience and the Magisterium condemns such behaviour. Over time the condemnations cease and the practice is tolerated. In due course the theologians work on the issue and finally there is a document which proclaims "that, as the Church has always taught, this practice is in harmony with the teachings of the Gospels". It is just a different way of initiating change. Not sure which is the most painful or the most confusing. The early Christians were called Followers of The Way. There were no Creeds or Gospels at that time, and new ideas and insights were encouraged, so that soon there were about 50 Gospels freely circulating, all seemingly equally quoted and esteemed. Such was the Tradition they established. This is one tradition that did not last. It can be said that The Way failed. But it did not fail. It did its job of fostering Universal Love, and placing the role of the Spirit above material concerns. It was not destined to last in the form it began. It was a stage of evolution. With its conquest of the Roman Empire, new structures evolved; not all of them in the spirit of the Way. With the acquisition of political power, conformity could be enforced. Freedom of expression could be controlled. Scientific discoveries that seemed to clash with religious interpretations were suppressed. Many writings were burned. As more power accrued, the authors could also be burned. As power waned, Lists of prohibited books could be issued. Even today there is pressure to silence opinions that seem to suggest further evolution is needed. Lest, of course, the laity are not yet prepared. Surely in the aftermath of the child abuse scandals in the church in Australia, the US and Europe, the church hierarchy should consider itself in a state or mortal sin itself and needs to undergo a period of subservience to the faithful, and focus on listening, and asking for absolution from victims before it can move forward in a teaching/pastoral or leadership role. In this context, the church's moral authority seems dubious to me. How can the church in it's current state of mortal sin uphold sanctions on people, such as refusing communion to divorcees who seek to remain within the church community? When this is attempted we tend to loose same and drive people away from true faith. Suggest he lighten up a little and perhaps read and study something like say 'The Cloud of Unknowing' by 14th century English Contemplative to help him discover truth, rather than turning to such dogmatic documentation and hurling fury at people like Cardinal Kasper. Any institution that excludes 50% of the population from positions of decision making and power is speaking a very warped language. Freedom would mean that all voices were respected and listened to and given equal weight. John Whitehead expressed his belief "that the comments of HH attempt to put 'God in a box'." No John, HH was simply quoting the Scriptural basis for the Church's traditional prohibition of communion for divorced and remarried Catholics. Apart from Father Andrew's reference to the prohibition being one of the Church's "disciplinary practices" I have yet to hear or read any authoritative Church statement that the basis of the prohibition, as presented by HH, is open to question. Now that Pope Francis is openly canvassing a re-think on this question, I am curious to know how any change could be justified. I recognise it is difficult for the Vatican to make radical changes to traditional teaching, because such changes indicate to the laity that the Church cannot be sure it teaches truth, as it has traditionally claimed. However, I look forward to the loosening of such constraints because I do think the Church has traditionally presented 'God in a box' to the faithful. Therefore I am pleased with the more liberal breeze attempting to blow through the Vatican now, for the first time since 1968. The leap from church teaching to excluding those "conscious" of grave save is typical of the mindset that attempts to slot spiritual/religious matters neatly into a far right economical mindset. It's the same mindset that led to the arrest, trial and Crucifixion of Jesus. And by the way, did Judas partake of the bread during the Last Supper? John, I was privileged many years ago to read and study "The Cloud" under the great expert Fr Austin Cooper OMI. I cannot recall Fr Cooper inferring from that work's perfectly sound and beautiful apophatic theology that we may dispute the teachings of the Church. Someone said that theology was the process by which atheists could be members of the Anglican Church. surely whatever the Vatican says Catholics will cherry pick what they believe and after that what they do with an informed or uninformed conscience. Many of the examples in this piece suggest not a leap of faith, but a creep of faith to matters well beyond essential commitment to the message of the New Testament. Much of the use of orthodoxy in the church has been the exercise of clericalism (we know better than you, 'cos we are superior) or the facility to exclude uncomfortable ideas or uncomfortable people, at the margins. Didn't Christ talk about this when describing the practice of the Scribes and Pharisees? Point taken Ian Fraser, yet all the words of intellectualisation cannot get us to know this thing we call God...our intellectualisations will always be incorrect when attempting to understand the unknowable. In fact to sum, I believe that the intellect can define what God is not (certainly not something in time and space) ... intellect should be used until it runs its course, but it is only through Love that we can start to reach God. I believe that this is what Francis is attempting! It does seem that at times clerical leadership and spiritual wisdom do not coincide enough. Authoritarianism is one of the things that can corrupt the link between the two. The existence of authoritarianism speaks to the formation and experience of clerics. Many of us today are sufficiently nuanced to see a priest speaking from a deficit of spiritual wisdom. We are sufficiently discerning and humble, and have lived enough to 'smell' it. Pope Francis, I think, is asking his fellow priests to get some more life experience and to listen and respond appropriately to this experience. What is happening if they cannot? The Pope, even though Argentine born, is I believe of purely Italian ancestry and would well know the Italian phrase "la bella figura". What it means in practice is that, when the Pope or the Vatican makes a clear doctrinal or moral statement it is expected that the statement will be received in public with quiet respect. What people do about carrying out any directives may differ from this official line. I suspect Catholics, both at the centre and on the margins, are as tired, frayed and quietly despairing as anyone else. What they want is not another rarefied theological argument, nor a laying down of the law, but an example of how to live. Christianity is a way of life. One of the things it should do is to provide a simple enough framework for the average person to live by. I think the Pope is attempting to "square the circle" by combining orthodox Catholic belief with compassion. It is not as impossible as some think and relies more on his personal example than anything else. Chattering Catholics and fellow travellers may wish to dissect, criticise or opinionate loud and long but I think he is succeeding. Ian Fraser @ April 10: “I recognise it is difficult for the Vatican to make radical changes to traditional teaching, because such changes indicate to the laity that the Church cannot be sure it teaches truth, as it has traditionally claimed.” Spot on. And not only the laity: as is evident in the current discussion, cardinals, bishops, and theologians of eminent stature such as Fr Aidan Nichols O.P. recognise that admitting those in mortal sin to Holy Communion would call into question not only many key doctrines of sacramental theology, but the very notion of the Catholic Church as infallibly speaking with the voice of Christ. Conversely, many of those calling for a change in the rule, such as several on this very blog post itself, also show by their comments that they clearly reject the teaching authority of the Church – which authority under-girds the doctrine of the real presence of Christ in the Eucharist. In other words, they are busy sawing off the branch they are sitting on. It would be amusing to watch if it weren't such a serious matter. From what I see and hear in my corner of the world, conservative pastors are still holding tight reins on a traditionalist doctrine (pre-Vatican II) for teachers and parish workers in their institutions. Pope Francis has had little influence there. Nothing I've read in these comments gives me the impression anyone is calling for church teaching to be changed. I'm sure if someone was aware of being in a state of mortal sin, they would not be in the frame of mind to be receiving communion. The issue fir me is when someone with an informed conscience who has gone though a process of spiritual discernment, and repentance. Rather than a denial of the presence of Christ in the Eucharist, the desire to repent in order to receive communion is an affirmation of that. I agree with Pope Francis that open discussion of what is significant in bringing together unity of members of the church should be a priority. I cannot understand why there are some bishops who refuse to see his point of view. I think a referendum of the Pope's idea should be distributed to the members of the Catholic Church for approval in order to settle this problem. After all, it is the members that make the Church, not its bishops.